Introducing your pet to a new home can be a lesson in patience. Whether you’re bringing home a newly-adopted dog or cat, or you’re moving with your four-legged family member to a new house or city, relocating can be tougher on your pet than you may realize. If your family is moving overseas, it’s highly likely you’ll be living in an apartment or smaller quarters that you’ve been used to in the UK or the US. So not only is it all new, it’s very different in other ways. There may be no personal yard to play in. Or you may be moving to a foreign city where cats aren’t allowed to roam free outdoors. Knowing what you and your pet will face will during an international move will help both of you acclimate smoothly. Just think how stressful moving is for you. All that mess and confusion. Now think about the fact that your pet doesn’t understand what’s happening. And he takes his cues from you. In the midst of all this chaos, you must lead with Zen-like calm. And good humor, even in the face of moving-related misbehaviors. “Forgetting” their training – or acting weirdly in other ways – are signs your pet feels a lack of control. His comfort zone is in disarray. He may go potty indoors, become irritable, or hide under the bed or on top of the refrigerator (not your dog, probably). Cats sometimes hide for hours or days before they feel ready to venture out. The thought of unpacking may make you feel the same way, but you’re the human here. Just make sure you kitty’s food, water, and litter box are nearby – and spend some time sitting nearby yourself, speaking in reassuring tones. Read our article on how to reduce stress on your pet during a move here. Taking steps to alleviate your pet’s anxiety will help you relax, too. That’s doubly motivating, yes? So let’s get started. Most dogs are pretty adventurous, so your pooch may have few qualms about exploring his new home. Nonetheless, you can help him see this as a fun new experience. Cats, on the other hand, are usually not in favor of change. You’ll want to be even more aware of your kitty’s response to moving, and you have to be even more patient as he adjusts. 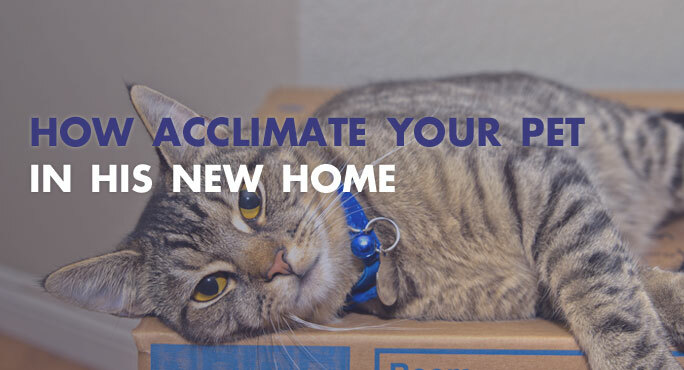 Experts recommend confining both cats and dogs initially after a move. Create a “safe place” for them, either a room you can close off or a crate, if your dog is trained to use one. You can gradually introduce your guy to the rest of your abode. In fact, if your pet is a dog, keep him with you while you’re in the house, so he can look around under your watchful eye. Being with you is reassuring, too – he can see you haven’t abandoned him. One thing humans do love about moving is that you get to acquire new things for your new home. Don’t extend this thinking to your pet. They need all the reassurance they can get, and a primary part of that is retaining “their” stuff. Their food and water bowls, bedding, and toys. Set up your pet’s feeding station in as similar a location as possible to the old one. And don’t change it. Put his bed(s) in similar positions relative to furniture. But note that both cats and dogs often like to scope out their own favorite snoozing spots, so watch for that and move your pet’s bed if a new location seems to make him happiest. If possible, arrange get-acquainted sessions with any neighboring canines or felines. You’ll want your new neighbors to recognize your pet, and especially if you have a dog, formal, positive introductions can help avoid potential territorial disputes. Take things gradually. And remember, the most important thing in your pet’s life is you. The more loving and understanding you are, the easier it will be for your furred one to acclimate quickly to his new surroundings. Extra time spent petting, playing, or just sitting together will go a long way toward showing your guy he’s safe and sound in his new home. You’ll feel better, too.